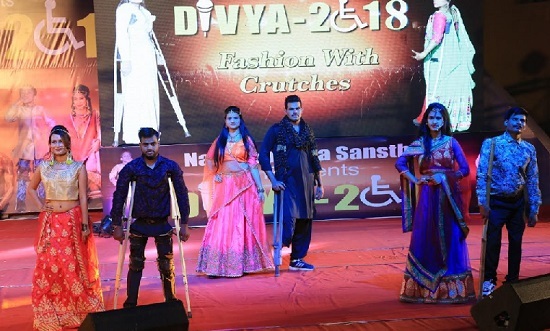 Jaipur : An ultimate destination of specially able individuals - Narayan Seva Sansthan, today hosted an extravaganza Fashion and Talent Show under its much awaited event ‘Divya 2018’ in pink city Jaipur at Ravindra Manch. To motivate the participants of this show, Bollywood Actress and performer Sudha Chandran remained present and cheered the specially able rockstars. The fashion show was organized in four rounds mainly, Fashion Round with Calipers, Fashion Round with Wheelchair, Fashion Round with Crutches, Fashion Round with Artificial Limbs. Each round had 10 participant models walking on the ramp. With every specially able model, the able co-models were present to support them on the ramp. The shining faces of these specially able models communicated high spirits and confidence being into the mainstream with all glories. Narayan Seva Sansthan runs 1100 bedded hospital for specially abled where it conducts major surgeries free of cost for specially able individuals to make them physically fit and on top of that, helps such humans to enhance their skills into a specific stream under vocational programmes and helps to find employment too. Narayan Seva Sansthan has a skill center inside its campus where training on tailoring work is provided. These trained handicapped individuals have designed the best of the apparels to showcase on the ramp by specially abled models.